Now this is on the very best authority. Dame Julia Elizabeth Andrews, the British born actress who, as Julie Andrews, achieved a considerable international reputation for her role in the film version of 'The Sound of Music' once remarked, "I don't do country.". Yesterday we 'did' country. After an early start, when we were collected from home by friends Zoli and Viktor in their gleaming, and immaculate, motor car, we set off into some of Hungary's most picturesque, and remote, countryside rather in the manner of a latter day Dr. David Livingstone. 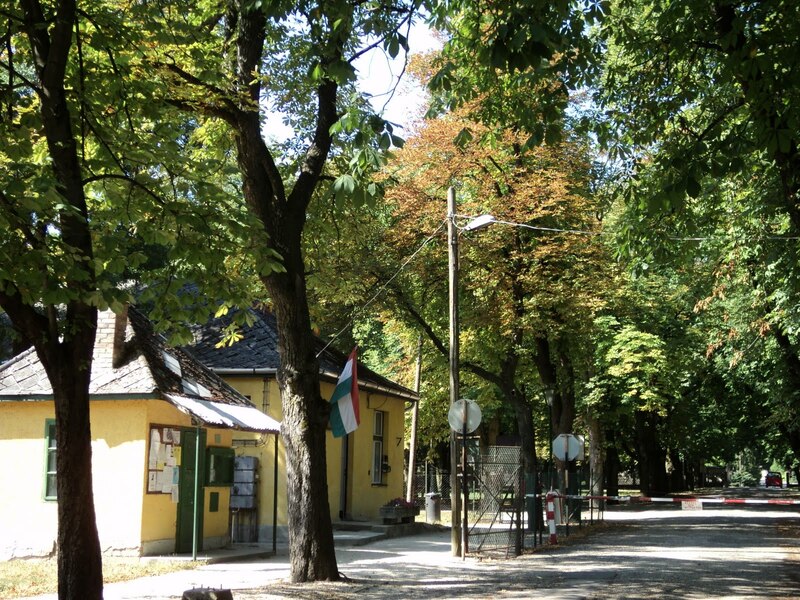 Imagine the excitement early on in the day when we chanced upon the former Esterhazy Kastély, concealed from public scrutiny, the entrance barred by military style barriers, a Baroque mansion of 1781 right in the heart of the village of Csákvár. A friendly word with the security guard, and we were in. Such magnificence! Confiscated by the State, this splendid palace, with its extensive English style parkland, is now run as a sanatorium for the treatment of pulmonary disease and has, as a consequence, seen somewhat better days. But much remains. Not least some fine, if incongruous, statuary, a massive stone grotto serving as a look-out, and some wonderful, largely intact, ironwork. Best of all, a private chapel, of the period, sadly locked, but currently in use as a store for books and patients' case files. exterior views of the chapel with seated patients in designated smoking area! But this is all by the by. For this perfect day, in which we 'took in' a ruined castle, the stylish lakeside town of Balatonfúred, with drinks in the Yacht Club, and a second palace, ended with the most thrilling of news. For upon opening our email messages late last night, we discovered to our great surprise and joy that we had won a giveaway, a prize of [and could anything be more appropriate?] a most attractive and immensely practical Field Bag and Field Notebook, ideal for 'doing' the country. For anyone who loves 'Home', 'History' and 'Nature', then Country Weekend is the blog to follow. Jen's posts are always a delight to read, whether she is describing a summer's walk, a vintage find, a recently read novel, life in her lovely store, or giving us a glimpse of an art work, a step into the past, or simply reflecting on today and what tomorrow may bring. Whatever her subject, she writes with both feeling and a quiet authority, never failing to engage her audience. As for the Field Bag, just as soon as it arrives, we shall be heading straight for the outdoors! It does please me that the private chapel has been put to better use as a store room. Countryside is nice to visit, but isn't it always good to get back to town. Pix of the Field Bag and Notebook. Please. Well if one has to have pulmonary disease, one can think of worse places to have it. I know so little about Hungary and your bog has me wanting to know a lot more. Do you have a book recommendation - not a stats and details kind of book, more a novel set during the communist era, or maybe after the fall? And great news about the giveaway win. What by the way is a 'field bag'? Congratulations. I was hoping to see a picture of the well-buffed motor car. What luck to be an inmate of the sanatorium! It looks wonderful. How eloquently you have described your foray into the wilds of the countryside. I can only imaging the robust and enthralling conversation enjoyed by the four of you as such grand views of rural beauty presented themselves’. Views that upon fading were shortly replaced by another as breath taking. I can see by your photographs that the castle has definitely seen better days, but like an aging beauty, it still has good bones. And it's doubtlessly getting better use than ever before. By the way: This castle strikes me as a great place to set a book...! A mystery, of course. And then to top off the day you won a terrific prize. Great news. Now we are all prize-winners. This must have been our lucky week! I will definitely check out the Country Weekend blog, it sounds like something I'd enjoy. A designated smoking area, indeed! How wonderful and what a day. I adore Julie Andrews and grew up watching entirely too much of her beaming smile and silvery voice on our VHS! And is it not fascinating and highly ironic the way the state so quickly confiscates its most stunning landmarks only to render them run down and worse off for the wear? Doesn't speak too highly of the state, now does it? What luck and what exquisite timing to win a Field Bag rife for decking out with provisions for your next impromptu adventure. I'm not very good at " doing the country" either but when it has such marvellous architecture then the whole outdoorsy roughing it in ugly clothes tableau takes on an entirely different hue. And if the field bag manages to hold two coupes and a half bottle of champagne, even better. If country means the glory and beauty that you discovered here, I may rethink "doing country." What a magnificent place you discovered! I love to discover grand places like this that are a bit less than what they once were. When you visit them, you feel their strength, their glory hidden under things like the patient files. Congratulations on your field bag win! Looks like you might just need it! The Field Bag and notebook will be coming to the sidebar any time soon......well, as soon as we have mastered the art of doing so!! Yes, wonderful surroundings and an area renowned for its air quality would seem to be the perfect medication! It is difficult to recommend a good read as many are, sadly, somewhat dull. However, Roger Gough's 'A Good Comrade'- János Kádár, Communism and Hungary you might find of interest. It looks superb, both the interior and the exterior. What a lovely way to spend a sunny weekend. Congratulations on the prizes! Good morning, my dear Hattats! In any event, I love that you opened with (Dame) Julie Andrews and then turned her proclamation on its ear. Your lives are such a bonny and sharp vicarious window through which to live things I would never, never experience otherwise. Where is the link to Jen's blog? It sounds like one I might savor! The exterior of the castle looks to have been well maintained, but the interior seems to be a shadow of its former self. Congratulations on getting the Field Bag. I read your comments on Country Weekend, and you deserved to win. A most interesting point you raise about the term 'Baroque'. Hungarian Baroque is a term which can be applied to buildings from the early C17 to the late C18. Interestingly, the Baroque style in Hungary is noted by its lack of excess in terms of ornamentation, moving towards Neo- Classicism. Hence, the Esterhazy Palace does appear rather more modest in terms of decoration than one might otherwise expect. As for the sanatorium, even smoking seemed to be allowed.....what is not to like?!!! Zoli and Viktor really do make the most wonderful travel companions. Fully au fait with GPS navigation systems, we never lose our way and highly knowledgeable about coffee houses and restaurants as well as the historical sites and sights. In addition, their fluent Hungarian and engaging manner seems to allow us free entry almost anywhere! Yes, you are so right. Beautiful bones still and just awaiting the facelift to return it to its former splendour. But, will this happen?!! Thank you, Linda, it was indeed a most perfect day out. The weather was just wonderful with wall to wall azure blue skies and so much of interest to see and do. Yes, we can well see the Esterhazy Palace as a film set or setting for a novel. However, our second palace of the day was straight out of a Harry Potter book [we believe as we have not read any of them]. More of that in a future post! Yes, several of them and a number of patients taking advantage of them! In its day [the C18], the Esterhazy Palace would, indeed have looked remarkable. As you say, no expense was spared with the finest of materials being used. When built,the original house included a library, gallery, hunters hall and indoor area to exercise horses. Magnificence indeed! Great post and pictures, as always. I'm now off to check out Country Weekend. Regards! Obviously, we were rather out of step, so to speak, with the mood of the day, but we really never did see what was so wonderful about the 'Sound of Music', much preferring Miss Andrews in 'Mary Poppins'! However, can record numbers of film goers be wrong? The Hungarian State has much to answer for in terms of upkeep of its national heritage, not least its many Castles and Palaces which are generally in a piteous condition. Our sentiments entirely!! And, how clever of you to have guessed what we need the Field Bag for....as well as the Moose head, of course! Yes, unearthing sleeping beauty palaces within bosky woods is one thing, hiking up a hillside is quite another. Each to his own, as they say! And, you have captured so perfectly that wonderful feeling of peeling back the layers of time as one sees beneath the surface to reveal the former glory within one's imagination. The weather here has been glorious for weeks although days of 35C+ are really just too hot to do anything. Fortunately, Saturday was a perfect 29C, just right for exploring hidden treasures! You are too generous, but we are so pleased that you enjoy travelling along with us. One day, perhaps, we hope to read that wizardly production of a first novel by a talented girl, just waiting to be discovered like the Esterhazy Palace. The link to Jen's blog are the words 'Country Weekend'. For the life of us we seem unable to make it appear in pink!! The grotto was such fun and we all enjoyed ascending the steps. The Palace grounds were originally laid out as an English park, the idea being that one could ride around them and 'happen upon' the various statues, urns, grotto, lake etc. from the comfort of the open carriage. A marvellous idea we think! Yes, you are right. The exterior has obviously been paid some attention, not least of which is the roof which was in good repair. However, although we only saw a limited amount of the interior, it is in a somewhat parlous state. We are so pleased that you have enjoyed this foray into the countryside. And, yes, we were thrilled to know that we are winners, never having won anything before! Although it is not very clear, the link to Jen's blog is via the words 'Country Weekend'. Enjoy! Yes, we do too. In fact, if you had been there in person, we think that you would have LOVED it!! And this post was enormously interesting too - you continually surprise me with what Hungary has to offer. I was married once to a Hungarian and he was a dour, uninspiring old thing - and he is my benchmark of all things Hungarian. What a lovely place. I suppose if one is going to suffer from a pulmonary problem, one could do worse than staying at such a grand chateau. It seems a little "Magic Mountain" minus the mountains. I will check out the Country Weekend blog. Thanks for the suggetion. How really kind and very generous of you. And yes, we should most likely have a great time together on an outing with the Field Bag stuffed full of goodies. After your less than good experience with a Hungarian, we very much hope that some of this goes towards reviving your opinion of both the country and its people. Have a jolly Sunday evening! A wonderful place indeed but, we fear, the exterior appeared to be in much better condition than the interior and we did think it a little alarming to see patients obviously permitted to smoke. Quite what that is doing for their lungs is anybody's guess! Congratulations! Happy trekking to you! I am so sad that I have misplaced my National Trust field bag sometime over the years. Also, I am delighted to say, that I, who sometimes laments "I never win anything" recently won a gasoline card worth $25!! Find joy where it lands! Happy Sunday to you! Another lovely post, Jane and Lance, informative and beautifully illustrated, though I for one am sad that the chapel is now so far from being used for its original purpose. Congratulations on being prize winners. What fun and I'm sure you'll put your prizes to excellent use. Although it has seen better days, this Palace still has many wonderful, original features intact. From your photographs, the building and ground's seem to have a lovely 'feel' about it.....would I be right in saying that ? ..... it is now doing wonderful work and I do hope that it won't deteriorate too much. Do they get any money for it's upkeep ? I really hope so. ..... and well done on your giveaway win. A Field Bag and Field Notebook couldn't have gone to a better pair of bloggers !! Will you treat me to a picture of the gleaming motor? What I imagine you riding in is, at least, a RR, with the two of you ensconced in the back, sipping champagne, while you are being driven - sedately - around the countryside, doors opening as if by magic, and luncheon laid on in the private rooms at a country house retreat, perhaps a shooting lodge? We fear that you may have got the wrong impression of us......'trekking' would not really be our cup of tea. Walking, yes, peering into long forgotten palaces, definitely and eating 'al fresco' most certainly, but nothing that amounts to the need for stout shoes!! And we were rather sad too. Indeed, it turned out to be a day of disused chapels as the second derelict mansion we saw also had a private chapel which had long since fallen into disrepair. However, the signs were that it is to be renovated and with its beautiful, rib-vaulted ceiling, we felt that to be just as well!! Lovely post. I may not be a dame, but I sure do do country. Peace and best for the week ahead. We are fairly certain that you would have the most wonderful time seeking out and looking at these palatial sleeping beauties which are dotted throughout the Hungarian countryside. They are, as you rightly suggest, incredibly atmospheric with a somewhat romantic air about them, even if tinged with sadness. Architecturally, they are gems. You sound to have had a wonderful time in Brighton with your sister. We too hope to catch the exhibition later in the year and shall certainly follow up your fish restaurant recommendation, for which,many thanks! No picture necessary.....you have it all in your mind's eye!! The only slight differece is the pace of the travelling. Viktor is a young man of speed!! No, but a great and very thoughtful guy certainly. And, contrary to what may be assumed, we actually rather enjoy 'doing' country! What a delightful account of your day in the country and to stumble upon Esterhazy Kastely must have added greatly to your day. Such grandour.The grotto looks spectacular and to cap it all off then the Yacht Club, you certainly were living it up! We thought you were lazing inside with the air-conditioning going full blast in Budapest. Congratulations on winning such an appropriate gift,and how timely, which reminds us that there are no coincidences in life. The only air condtioning in our apartment is the open window, hence a trip in the motor car where an all singing, all dancing, super efficient all filtering AC system is there at the touch of a button! What a wonderful day you had exploring the countryside. Congrats on your win! I cannot think of a more apt giveaway for you have to won. I have no doubt that you will put it to good use. We are absolutely thrilled to have won the Field Bag and notebook and cannot wait to give them their first outing. We have never played the Lottery and cannot recall ever having won anything, not even from a lucky dip, in the past. So we are doubly delighted with our prize! Julie Andrews was wrong - 'doing country' is one of the best past-times ever ..... as your photographs prove. That stately home is magnificent ... shame it is gradually falling into disrepair by being used as a sanitorium. Annie, you are sounding like a complete convert after your move from the London smoke. We shall see you in Barbour and tweeds yet! Would that we could have structures here of the likes of what you feature. How amazing it would be to hop in the car and go for a "magnificent palace" outing! However, having two huge mountain ranges within driving distance isn't so bad--so I suppose I shouldn't complain ;) Btw, congrats on the bag-winning! Strange that you should mention such an outing. We are now aware that there are countless hundreds of castles and palaces the length and breadth of Hungary in various states of repair or collapse, about which very little seems to be known or documented. As a result, we wondered if a massive castle/palace discovery trip could be orgainised rather in the style of James Lees Milne and the country houses of England. This may take some time!! Congratulations on persuading the guard to let you in - a magnificent building. Can't help thinking a bbc documentary on forgotten Hungarian architectural gems would be crying out for your enthusiastic and knowledgable presentation.. or has Michael Palin already done something along those lines? And good news about winning the field bag! I seem to have lost my comment, but if you should find I've written two, please dispose of one of them for me. I'm forever losing comments thanks to my weak connection. I went over to "Country Weekend", which I am now in love with, and visited her Etsy Store. I love the idea of having a vintage, nature store up in the Catskills. Your visit to the sanitorium and photos were interesting, but I can't understand why they would have a special place for smoking. Let and let live I suppose. There must be innumerable field trips waiting for you in Hungary, Jane and Lance; it is reassuring to know you'll now be appropriately equipped! I hope we get to hear of more of your jaunts and expeditions, both to see in greater detail this quiet part of the world, and to enjoy your delightful interpretation of it. As a smoker, I am relieved to see that patients at the sanatorium are entitled to smoke...someone, somewhere has got some sense and civility. The countryside is always lovely but I am prejudiced -smile-; your day looks like it was very nice. The private chapel...such a pity it's no longer in use as a chapel; we all need sanctuary and a place to worship and, apart from the great out of doors, what better place than God's own house? I’m city born but country bred (I pole vaulted out over the wall one night when I was about five and horrid) so I’ve spent most of my life swinging from tree to tree chasing roosters & wabbits in the boonies for my dinner. Although I really do love soaking up all that exciting buzz and babble of city life on five day breaks now and again. Barcelona, San Sebastian & Paris, especially. Fair play to you two for blagging your way past the security chap. You must be the only couple I know, in this star system anyway, who have actually broken into a sanatorium. What an elegant and splendid looking building. There are worse ways to spend a day in the country. Well done you’s and your hosts, and likewise for the prize and the plug to the ‘Country Weekend’ blog. Truly love your blog Jane & Lance. A big classy read, with so much diversity and interest. Pure ‘rhapsody!’ (Sorry - Bin wanting to type that last one all day long) It’s going to be a pleasure ploughing back over your past posts in the coming decade, so bear with me won’t you. I’m so glad I tripped over you on Mme ‘Fly in the Web’s’ exceptional two blogs, and thank you both again for posting your recent comments on my little blogette. (My…you’re brave bunny wunny’s aren’t you!) Much appreciated. Thanks too for posting the widget link to Elisabeth Rose Stanton’s – Penspaper Studio blog. I signed up straight away. What an incredibly talented illustrator Elisabeth is. I expect to see her work gain the highest of recognitions in the coming years. She already deserves to. Go to – in this order: Design / template designer / advanced / then in the second column in, scroll down & select ‘links’ (it’s 2nd from top). Once on ‘links’, look right to the ‘Visited Colour’ section and select/click on your colour of choice. NB: Just below the advanced template window top of screen, if you use your partly exposed blog posts slider bar on the far right to bring ‘any’ piece of pre highlighted ‘link to’ word or text into view…as you then click on the different colour choices above in the ‘Visited Colour’ section, you will be able to see your already highlighted ‘link to’ word/text change colour accordingly. It will be the same chosen colour for all the ‘link to’s’ on all your posts, unless you change it again. The colour swatch section on the left that says ‘link colour’ refers to actual URL links you might occasionally ‘copy & paste’ into your blog posts, or underneath someone elses photo image and so on. When done, click on the orange ‘apply to blog’ tab top right, and click to ‘view blog’. Caveat Emptor: If having duly followed this little tip tome, your wonderful looking blog here thence becomes completely and utterly…obliterated, I should probably tell you that I normally lurk in a very small cave somewhere in the middle of Greenland. Unlike Dame Julie I do "do" country even having been born in the country I still return to it! This palace is on a lot more of a human scale than those in St. Petersburg. Love the sentence " a friendly word with the security guard and we were in" conjures up all sorts of visions. So glad you had a lovely day--I love the image of you motoring about the countryside. The creamy yellow of the mansion is lovely. Too bad the chapel isn't in use (as a chapel). I am overwhelmed by the kind things you wrote about my blog, and I truly appreciate it. Your blog sets a high standard and your encouragement and support mean a great deal to me. We have certainly seen enough of these former palaces to feel that they really should be documented in some way or other. Sadly, even when restored and open to the public, they are far removed from what we have come to expect from the National Trust, English Heritage, et al. The State, as in the case of the sanatorium, seems to have very little idea about the need to preserve the fabric of the interior. Michael Palin, get your skates on! Your second comment did, in fact, make it through the ether and thank you for taking the trouble to write again. It is such a trial when the connection goes which happens with us too quite often. Country Weekend is a delightful blog and we are so pleased that you have discovered it and enjoy what Jen writes. AS for the smoking in a sanatorium dealing with lung problems - quite beyond us too!! The weather was, as you can see from the blue skies, absolutely perfect and although hot, 32C, was cooler than it has been. Additionally, the motor car was fitted with the very latest in air conditioning. Nothing less from Zoli and Viktor! The sanatorium is in a lovely building but which, we fear, is in need of huge sums of money if it is ever to be restored to what it once was. It was an absolutely wonderful day, Faisal, and we are now most interested to discover many more of these former palaces which are all in State hands and mostly used for institutional purposes with one or two notable exceptions. We were, it has to be said, somewhat surprised to see patients merrily smoking away when, we assumed, they were there because of problems with their lungs. But, free society, judge not, and all of that!! Have a very happy week. We too were sorry to see the chapel put to some other use and, later in the day, at another completely different palace, now partially restored, the chapel was empty and in a very poor state of repair. This of course dates from the period when all religion was either banned or only reluctantly tolerated. But, generally, you will be pleased to know, the churches in Hungary appear to be in good condition after years of neglect and many are really thriving. First, thank you so much for taking the time and trouble to write such a very detailed, and in places most lively and amusing, comment. This is very much appreciated as are the instructions which only a fool, or possibly two fools, could fail to follow when it comes to links 'en couleur'!! We shall give it our best shot, as they say. We are delighted that you have found our other links to your liking - there is indeed so much talent to be discovered in the blogosphere. And thank you for the Pure(!!) 'rhapsody' link which we shall most certainly follow up. It was, as you say, really good to have got by the security guard at the sanatorium and to be free to wander at will. What a place which, we decided, had probably not changed at all since the fall of the old regime. We left with the feeling that most likely a private Swiss sanatorium is run along rather different lines! Later we talked our way into another similar place about which we shall certainly post in the future. All such fun! Oh, Barbara, we are so pleased that you spotted the door of the women's loos. What an absolute gem and heaven alone knows what it can have been like inside. We are all for adventure, but there are limits! And yes, we do rather like things even more when they age. Much more comfortable to live with as opposed to the bright, brashness of the new. Actually, we too 'do' the country although after twenty-five years spent in a very rural area we are rather enjoying city life! We can well imagine the scale of some of the Russian palaces and, if we understand correctly, the Hermitage is vast. We are much looking forward to your posts on your recent exploration of the Baltic states. Here in Hungary a 'friendly word', most often accompanied with a little 'gift' of a few forint [the Hungarian currency] goes a very long way and, surprisingly, opens quite a number of otherwise closed doors. In this case, to be fair, the words were enough. Our day was absolutely perfect in every possible way and both Zoli and Viktor went to enormous trouble to make it so. The only possible thing missing - a Field Bag! And that will not be a problem in the future!! We do hope that you approve of your picture of the bags on our sidebar! How intriguing! I didn't realise there are still sanatoriums for people with lung diseases, I thought they were purely 19th century places for poor souls with T.B. What an interesting visit you must have had. Visiting the sanatorium was indeed rather like stepping back into the C19! It was all so incongruous - the palatial proportions of the C18 but the 1950 furnishings. So very interesting! This does seem the best way to "do country"; although I am not averse to driving myself, I am quite happy if someone else offers their skills in that department, allowing one to see far more, than if one was driving onself. Alas, this is not a skill mastered by my better half, despite his having a licence, (to kill, I usually suggest - unkindly). thank you for such a lovely start to my day. what a magnificent country ride and subsequent discovery. your photos are wonderful....i keep going back to the cloak room door. A Field Bag and Field Notebook! Oh you lucky things. I salute you from the depths of my envy, and hope this is but the first of a long succession of fabulous giveaway wins for you, richly deserved for your energetic and intelligent contribution to Blogtopia. Congrats to you Jane and Lance! How exciting and makes waiting for the post that much more fun! Your trip to the country sounds wonderful and that building is truly magnificent. The funeral of "the last King of Hungary" was featured on the news here in Sydney on the weekend. I found the tradition of bringing the heart to Hungary for burial, according to custom, really interesting. I was so happy that I had read your post and was familiar with what was being reported - thankyou! We love to be driven [although perhaps not by your husband given your comment]! As you say, one sees so much more when not having to keep an eye on the road. Now we longer have a car of our own, we are increasing reluctant to get behind the wheel, especially when driving on the right is required. We are so pleased that you have enjoyed the tour, thank you for your kind words. Yes, the door is so appealing. A perfect example of shabby chic we think! But, most important are the wonderful bloggie chums, such as you, dear Mise, whom we have been fortunate enough to meet along the way. Have a happy week! How right you are, waiting for a parcel in the post is so good unless one is in Hungary since, sadly, parcels have a very nasty habit of taking years to arrive or, indeed, never to make the letter box at all! How amazing that the funeral was broadcast on Australian television. As far as we aware they have yet to decide on the final burial place for the heart....we shall keep you posted so that you can be ahead of the game in the Antipodes! Absolutely! So, what is to be made of all that talk, or rather singing, of 'Going to the Hills' through which Dame J. made her name [and a considerable amount of money]?!! Thank you, Jane and Lance, for the lovely trip you’ve taken us on. I like old architectures, ruins, and rural area. The state owned sanatorium shows extinguished gloss of the house which once sparkled. Some parts seem to be in a state of decay, but adorably so, like the columns or the door in the photos. The grotto and the steps are still beautiful. On your visit to my blog, you seem to have gotten interested in a bamboo grove. When you have time, please return my blog and read “The beauty and strength of bamboo” posted on 30th of May. The bamboo grove is within 15 minutes’ drive from my house. Wish you happy days ahead. Like you, we find old buildings which are slightly less than perfect or, as you so wonderfully describe, with 'extinguished gloss', particularly appealing. And there are rather a lot of them around here!! We so loved the bamboo grove and will most certainly go and look at your post of 30th. May. Thank you so much. Excellent tour of the house, faded grandeur indeed! Now that you are the proud owners of a field bag you may find yourselves 'doing country' a bit more often! We are so pleased that you have enjoyed the 'visit'. Faded, yes, but still in our eyes wonderful. We must confess that we have asked for a Field Bag with a whale motif so we may be 'doing more beach' in future! Thank you for the compliment about the photographs. We are new to taking pictures and just point and click. More times than not, what we end up with is disastrous! Despite the fact that I am very terrified of horses and various summer insects, I "do" country from time to time. As always, thank you for the unique and informative post. We are certainly not overfond of bugs, beetles and creepy crawlies of all kinds so yes, in that respect, the country is a minefield! Thank you for your kind comment, we love to hear from you. As you may or may not know, I "do country" almost every weekend and once in a while, some days in between. I find it so refreshing to get away from the hectic pace in the city to connect with nature and often, history. What an intriguing place you were able to explore on your country trip. Hungary is very interesting and I look forward to my visit there in August. BTW, I did send you two emails regarding sites to see but perhaps I will just follow along here and then last the locals for recommendations once I arrive. What a FASCINATING blog! I am so glad to have found you through Suze. This is too cool! Congratulations! :) Im so happy for you both, do share with us when the goodies arrive! On another note, a lovely tour! It is always sad to see former glory diminished but still, glad to see it in use. We so enjoyed our day in the country and, although it may not appear so, we are very much country people having spent some twenty-five or more years in the depths of Herefordshire, a dozen miles from the nearest town. We have, in fact, sent an email re: your visit to Hungary, including many links to various sites of interest, only to find this morning that it has, apparently, been sent to the wrong address. How this can be, we have no idea but will investigate. This is most generous of you. And thank you too for becoming a Follower. We are more than delighted to have discovered your blog and are much looking forward to future posts. We certainly are thrilled to have won the Field Bag and Notebook and are much looking forward to their arrival. It is somewhat alarming to discover that there are many similar mansions in Hungary that have, in the past, been robbed of their contents and are now in a very poor state of repair. What is their future? we wonder. As a sanatorium we are not entirely certain that we should wish to be treated there and are half convinced that the few patients we saw were sent there a lifetime ago and have long since been forgotten. Whatever, it was a fascinating place and wonderful to be able to wander around almost at will. What a wonderful countryside have you got around you! Yes, we feel very fortunate indeed to have such beautiful countryside within easy reach. And you, of course, are surrounded by such beauty too! We are delighted that you have enjoyed travelling with us. We are thrilled that the Field Bag is in the post and cannot wait until we receive it! Just the name 'field bag' is thrilling, can't wait to see what it actually looks like. I can understand Miss Andrews, and always felt the countryside was pretty to look at from a speeding vehicle, but find myself enjoying it more and more these days. Off to visit that blog now. For many,many years we 'did' the country in a big way, our house and garden were practically in the middle of nowhere. But, these days we find ourselves rather liking the city life with all the many advantages that it brings. However, forays into the countryside to discover its hidden treasures definitely has its appeal. We are so excited about the imminent arrival of the field bag!! Yes, that is rather as we like to 'do' the country these days and never too far from home in the city. We rather like the Isle of Wight but the English weather has been somewhat disappointing we note and that does spoil the fun. Although we have no experience of living outside of Europe, we are well able to appreciate what you are saying here. Like you, we are always intrigued by old mansions, the more so when they have seen better days. What a perfect day you had! A ruined castle, drinks at the yacht club..sounds good to me! Through your posts you have piqued my interest in visiting Hungary...we hope to go to Europe next year, perhaps we will include Hungary in our itinerary. I imagine the Hungarian countryside to be totally beautiful and dotted with castles and stately homes, all with a fascinating history. I wonder what those friendly words were whispered in the security guard's ear .... *wink*! Congratulations on your win my dears. I just popped over to Jen's blog after seeing it on your side bar. I will go back and have a leisurely peruse. I love the limerick from Faisal - superb! Yes, it was indeed a very good day. We are so pleased to have kindled an interest in Hungary and do hope that you will think about including it in a European tour. Definitely different from the usual! The countryside is indeed beautiful, unspoilt and uncrowded and it is dotted with all kinds of interesting buildings. However, sadly, many of themost wonderful places are neglected and in desperate need of repair. Not without interest, though! We are pleased that you will have a look at 'Country Weekend' we think it is a delightful blog. What a spectacular property... you can sense that it's gone into hibernation awaiting better days when it is relieved of containing file cabinets and office furniture. You are darlings - thanks for contacting me and for kindly passing on the magazine giveaway. I am sure you are right, people who are unable to obtain a copy will be delighted to win! Hibernation, yes, a perfect way to describe this sleeping beauty of a place. And, what is so amazing is that there are countless such places all over the Hungarian countryside. It is, Dianne, a lovely gift and we are sure that someone will be thrilled to receive it. Zoli and Viktor have a marvellous knack of being able to gain entry to almost anywhere. We have no idea how they do it! The grandeur of these homes always amaze me! The tragedy in Hungary is that so many of these houses, having been confiscated from their original owners, are now in need of money and a new lease of life. Who, we ask, will save them? Thank you for your warm welcome! What an interesting day out you had. I enjoy outings like this as well. Lucky you to get inside one of those beautiful palaces. What I wonder, are they from the time when Austria-Hungary was one great empire and who lived in those magnificent places? Congratulations on your give-away too. I will have a look at Jen's blog. It sounds like a blog I might enjoy too. 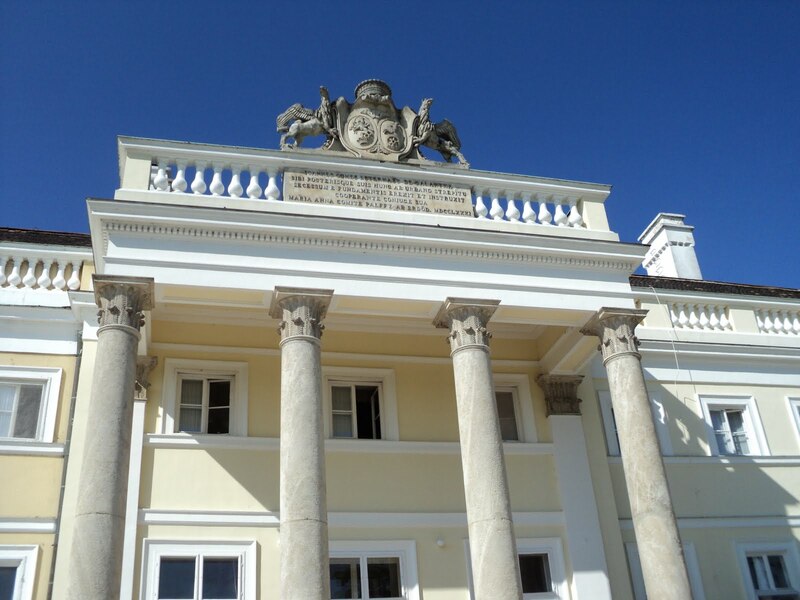 It was, as you may imagine, the most wonderful day out and for us it was so interesting to explore not just one, but two of these great mansions which are to be found, largely hidden, all over Hungary. Yes, as you say, they mainly date from the time of the Habsburg Empire, were home to the aristocracy and then, after the Second World War, were confiscated by the state and turned over to institutional purposes, such as the sanatorium. Something like the British National Trust is now desperately needed if they are to be saved for future generations. Thank you so much. And we are so pleased that you have enjoyed the post. What a beautiful, if slightly melancholy, place. Fascinating story and images! Congratulations on the win! I know you'll take it (and us) along on wonderful outings. Thank you for your visit and very kind comment! Actually I purchased all 7 glasses for a total of only $6 (3.71 pounds)! Perhaps I'll sip champagne (from one of the unchipped ones) in your honor this evening. Yes, there is something rather sad about the former Esterhazy mansion for whilst the exterior appears, in the main, to be in fairly good condition, the interior has been let go. And it was so strange for the whole place was almost deserted. We cannot believe the price of the glasses. What joy, and the way you had used them we thought to be really effective. 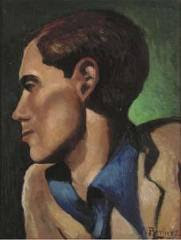 Do you by any chance know [or of] William Yeoward? We think tht you share many similar approaches to interior design, particularly where table settings are concerned. I wasn't familiar with Mr. Yeoward's work. After a quick search, I know something about his style and sensibilities and realize I need to purchase his book, Perfect Tables. I'm deeply honored by the comparison! We are so pleased that you have discovered William Yeoward and would certainly recommend his 'Perfect Tables' to you. Having said that, and this is in no way intended as flattery, your own creativity is his equal. We have returned to look once more at the glasses - wonderful. We were also very taken with the way in which you had arranged the table napkins whilst, as surely others will have said, the pink gladioli teamed with the china pink birds is a superb combination. We are so pleased to have found your blog. sounds absolutely delightful. Now I want to go to Hungary. It is all great fun and we are certain that you would find much to interest you in Hungary. Perhaps one day? Thank you for tracking my blog down and visiting! Congratulations on the giveaway prize - and what an amazing place that is! Just discovered you through Yiota's blog. What a great upbeat profile, makes me want to find out more. We were delighted to have found you and are thrilled that you have signed up as a Follower. There are so many wonderful hidden treasures in the Hungarian countryside and, as a travel writer, we are sure that you would find them of great interest too. Thank you so much for visiting. We are now setting off to find you and we hope to welcome you back here again soon. What a wonderful palace and what a wonderful day! Yes, the palace was truly memorable and a red letter day indeed. We are so pleased that you like 'doing country'!! I love a palace and I hoped to have lived in one someday.Don't look like it will happen, have to settle for the old 1845 mansion instead. Thanks for sharing and stopping by. Richard at My Old Historic House. Yes, we love a palace too, especially when it is not really open to the public! However, your beautiful home is compensation indeed!! The Hungarian countryside seems to be lovely! I enjoyed so much the field trip to Esterhazy Kastély. Thank you. Thank you for your most kind comment. We find the countryside so beautiful, but fear that our photographs do not do it justice. Oh to be invited to the country for the weekend by one of the nobs. I had almost forgotten what a clear blue sky looks like, thank you for reminding me. Congratulations on your win Jane & Lance...so happy for you, such a well deserved treat!! It's nice to see that at least the palace was not allowed to fall into ruins and shambles like "some other" grand old homes have been...but it would be nice to see them once again used as homes...ah well, such are the times, it's still there at least,and standing too which is good...and it's still very lovely. Nice that you were able to be let in...you must have known the secret password! Double thanks for stopping by PD, for it has allowed me to discover you! And most amusing to think of Julie Andrews, with her arms outstretched, singing of those so-alive hills, yet probably thinking all the while, get me out of here and back to London! But, dear Mitzi, we have always imagined you most weekends larking around with Debbie Devonshire or swanning around with the Spencers! Since yesterday the bue skies have gone from here. Grey, cloudy and cool now. Yes, at least the Esterhazy mansion is, as far as the exterior is concerned, in one piece but inside the ravages of time and war apply, as with most similar properties in Hungary [ransacked by the retreating German army and again by the advancing Russians at the end of World War II]. Such sad stories are to be told. What a wonderful image you paint of Julie Andrews on those wretched, so-alive [as you put it] hills!! And probably not so far from the truth! There were people who at the time saw that film upwards of a hundred times - we were not two of them! Thank you so much for becoming a Follower; it is much appreciated. Woow, it really seems like you had a great day in countryside.. I can't believe I live near Hungary and I still didn't visit, have to change that! It was, as you may imagine, a really wonderful day out and one in which our friends had carefully planned all we should do and see. Yes, indeed, you really should visit Hungary. Lovely, have a great weekend! Thank you so much. We are still talking about the day which was so very enjoyable. Have a happy weekend yourself. Hello, thank you for stopping over at my blog for a visit and for the kind words. I look forward to getting to know you! We are delighted to have found you too, Tracie, and warmly welcome you as a Follower. We are already looking forward to more of your posts. I love reading your blog and all the comments, too. I love the countryside, too -- in limited doses and am happiest knowing the Town isn't too far away. The Man spent the happiest days of his youth in deepest Herefordshire -- near the Welsh border in the town of Longtown. Now if only I had more time to spend on the Internet than two hours this Saturday morning! Yes, we suspect we are of similar opinions about the counryside. So lovely to look at and explore but we are happy to return to the city with its lively buzz and all manner of treats. How interesting that your husband grew up in Longtown, which we know from our Herefordshire days. A small world indeed. And you, dear Bill and Leo, are most generous, and very kind, in your comment. Later in the same day we were at another mansion where, even more sadly, the chapel had been completely ransacked of everything. A possible future post?!! "Country" is such an elastic term! I much prefer your version to ours in this northern geography, where "country" tends to really mean "the bush" and quite possibly involves grizzly bears!!! Oh yes, we should much rather have a ruined palace in a park than a grizzly in the bush!! I can't think of a more enjoyable vacation passtime than exploring European palaces, villas, and churches that are not on the usual tourist routes. This one looks so interesting. Very interesting post. Thank you. We agree with you entirely! We enjoy nothing better than to work our way into these hidden delights and poke around,rather like those adventurers of years gone by. We are not quite sure how one might book accommodation at this particular palace, but we do agree that you should have a rest after all that costume making. The other residents looked to us as if they had been staying for quite some time so it could be a case of once you manage to get in you will never wish to leave! !